Roomful of Teeth’s new album, Render, is music for the 21st century. Screw Newton. In the art of music, unlike the science of physics, works arising in reaction to other works are not always equal and opposite. Consider the case of Auto-Tune, the process of digital pitch-correction that has come to permeate the sound of pop vocal recordings, and its counteractive parallel, the renaissance in a cappella performance today. The latter is most famously associated with the craze for competitive team singing on high-school and college campuses, a phenomenon celebrated and accelerated by the 2012 movie Pitch Perfect and its upcoming sequel, Pitch Perfect 2. But there is a more serious—and, to my ears, more exciting—permutation of a cappella in the avant-garde world, led by a group called Roomful of Teeth, an eight-member vocal ensemble based in Massachusetts, which just released a brilliant new album titled Render. Auto-Tune is hardly all bad, of course. It’s tempting to groan at the sound of Kanye West’s heavily processed crooning on “Only One,” knowing as we all know that Kanye could probably not hit many (or any) of the notes on the track without electronic help. At this point, it’s safe to assume that the singing on nearly every pop single made for mass consumption has been Auto-Tuned, and it would be wise to presume that Auto-Tune is employed much, much more widely than most of us realize. I was in the studio to observe a jazz recording by a well-established vocalist several weeks ago, and I watched in the control room as the engineer fixed a couple of notes while the singer was still in the booth, unaware that the tweaking was taking place. Personally, I would rather hear Kanye West’s singing Auto-Tuned than listen to his voice un-retouched. As Auto-Tune and other digital music-making technologies (synthesizers, sampling and such) rose in prominence, the musical DIYers followed. Instrumentalists in their 20s and 30s have been picking up banjos, fiddles, and mandolins to play old-timey tunes from the era before records and radio. And singers still in school have been taking up a cappella, competing in demonstrations of their skill at harmonizing and improvising with voices that, as the movie titles remind us, strive for technical perfection without the aid of technology. A cappella competition is terrific, creative fun. The son of a couple of my best friends participates in it, and I don’t mean to diminish the music that he and his schoolmates are making by drawing attention to a different approach to a cappella that is considerably less popular. Roomful of Teeth is making some of the most rigorously venturesome and thrillingly inventive music being made by any ensemble, vocal or instrumental, today. 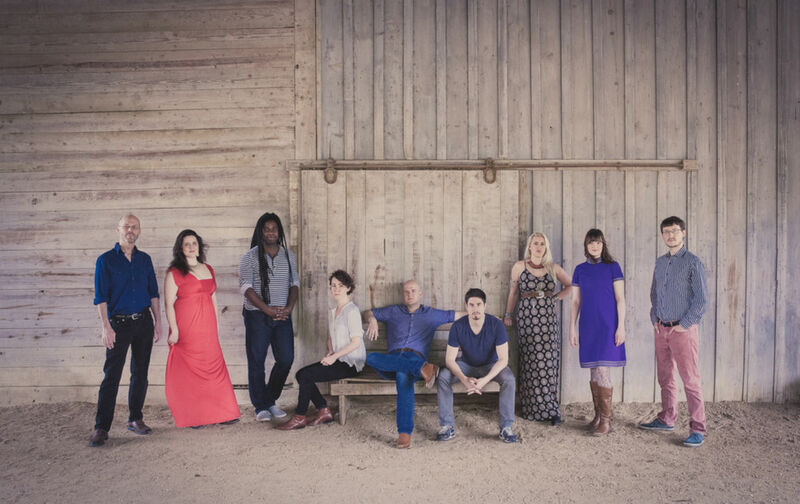 Founded six years ago, the group has released only two albums, the self-titled first of which included a sober but witty piece called “Partita for Eight Voices,” composed by one of the singers, the alto Caroline Shaw. In four movements, the piece employs both non-literal sounds (“aahs” and grunts and clicks of the tongue) and fragments of English phrases (“around,” “to the side”) as elements that repeat and come together like the instrumental components of a fugue. The record company, New Amsterdam Records, submitted Shaw’s piece for a Pulitzer Prize for Music, and it won. Render, released this week, is every bit as ambitious and free-spirited as its predecessor, and the group’s performances are even more assured. There are seven compositions presented as nine tracks, with the three movements of one piece, “The Ascendant,” dropped in among the other works. Three of the album’s pieces have words: “The Ascendant” (a setting of verse by the Australian poet Maria Zajkowski, composed by Wally Gunn), “Vesper Sparrow” (composed by Missy Mazzoli to text by Farnoosh Fathi), and “Suonare/To Sound” (words and music by Eric Dudley). Yet, the text is unessential. The vocal sounds themselves are so expressive—so varied in texture and color, alive and full of surprise—that they are fully satisfying on their own. The music on Render draws from more vocal traditions than I can identify. Those that I could recognize include strains of Tibetan chant, jazz vocalese, yodelling, Balkan folk song, the cowboy harmony of the Sons of the Pioneers, and even the metallic ringing of synthesized pop. Using what was no doubt the first musical instrument in human history, the voice, Roomful of Teeth makes music that could exist only in the 21st century.